Book direct for the lowest price guarantee – we’ll price match the lowest rate for our property. 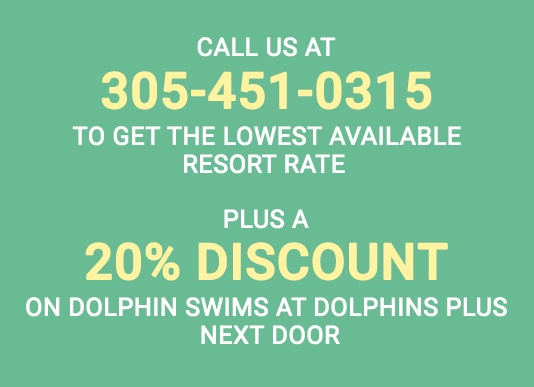 At Dolphin Point Villas we want you to enjoy the most relaxing vacation at the best possible price! Our Villas are absolutely delightful and offer all of the conveniences of home. If you find a lower rate, give us a call at 305-451-0315 to let us know and we’ll price match it. Unlike other resorts in the Keys, we never impose resort fees. Instead, we offer a boat launch and dockage, paddleboards, and kayaks free of charge! Plus, we have a private beach and pool on the property for you to enjoy during your stay. And, if that wasn’t enough, as registered guests you save 20% on dolphin encounters at Dolphins Plus, our partners next door. Simply wake up and walk over to the Dolphins Plus gift shop to check in. We’ll make it easy for you – by making your reservations for Dolphins Plus at the same time you book your vacation stay with us. We ask for 10-days notice prior to your arrival date to cancel/modify a reservation. Any cancellations made more that 10-days prior to arrival date will be refunded in full less a $25 cancellation service fee. Cancellations made within 10-days of the arrival date will be responsible for 50% of the total cost of the stay or one-night, plus all applicable taxes, whichever is greater. NO REFUNDS will be offered for cancellations made within 72 hours of your scheduled stay. Any/All reservations during holiday date(s) range(s), including but not limited to New Years', American Independence (July 4th), Thanksgiving, Christmas, Easter, Fantasy Fest, Lobster Mini-Season, etc. must be canceled/modified no less than thirty (30) days before arrival date in order to be eligible for a full refund less a $25.00 cancellation/processing fee. Holiday date range reservations canceled within 30 of arrival the date are non-refundable. Holiday date range reservations canceled within 30 of arrival date are non-refundable.